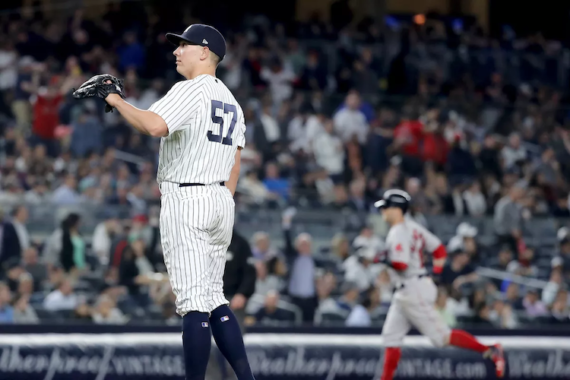 Right now, the only situation for Green is mop-up duty, in a game it would take a miracle for the Yankees to come back and win, and only being able to pitch in such a situation isn’t worthy of a roster spot. Today is April 24. April 1 was 23 days ago. April 1 was the day Aaron Hicks was initially expected to return to the Yankees lineup from his back injury. The Yankees' outfielder sprained his ankle, but remained in the game to score a run, and has already said he's playing no matter what. Clint Frazier is a breath of fresh air on this Yankees team. The Aaron Hicks injury situation, Aaron Boone's press conferences, Yankees-Red Sox trash talk and J.A. Happ's struggles in this week's Monday Mail. Ideally, the Yankees will win all three against the Royals this weekend and there won't be a sweep in Tampa. Yankees fans don't have to root for the Red Sox yet, but eventually we will. These Yankees are confusing. Not the 2019 Yankees, but the team filling in for the 2019 Yankees. I have tempered my expectations for the time being with the current roster. Prior to the Giants' loss to the Panthers, I did the best thing I have done in a long time: I gave up on Odell Beckham. The Yankees' World Series drought is now at nine years after the team's disappointing performance in the postseason. The Yankees lost to the Red Sox again and I was more than ready to leave Boston after three cold, wet days and two losses. Tuesday night sucked at Fenway Park sucked. Wednesday night at Fenway Park couldn't have gone any better. I have seen a lot of bad Yankees games at Fenway Park. April 10, 2018 can be added to the list. The 2018 Opening Day Toronto trip continues with Masahiro Tanaka pitching for the first time since Game 5 of the ALCS.